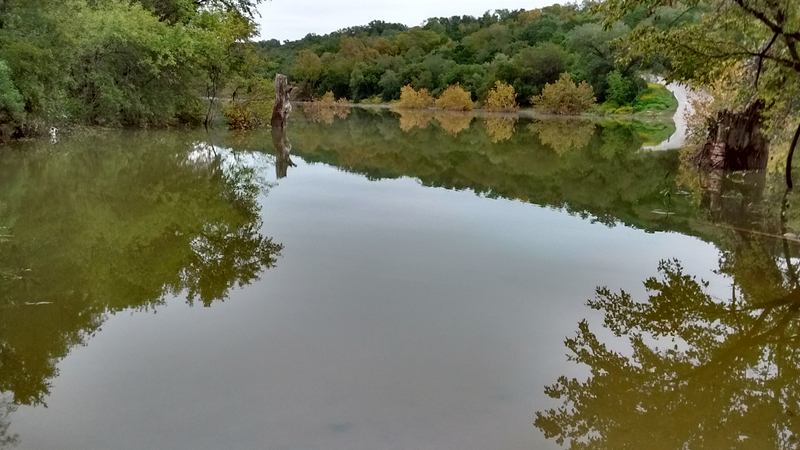 After a brutal summer that caused life to dry to a crisp, the skies opened up in early autumn and released a torrential downpour throughout central Texas. Westcave received 19 inches of rain in the months of September and October. 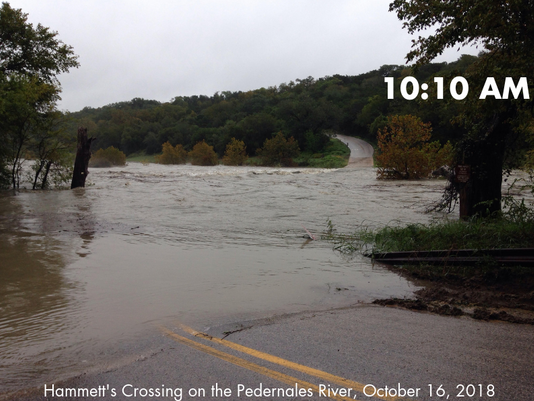 Many Hill Country rivers flooded. Most notably, Lake Travis on the Colorado river rose so high that it backed up into its surrounding tributaries, including the Pedernales River at Westcave Preserve. 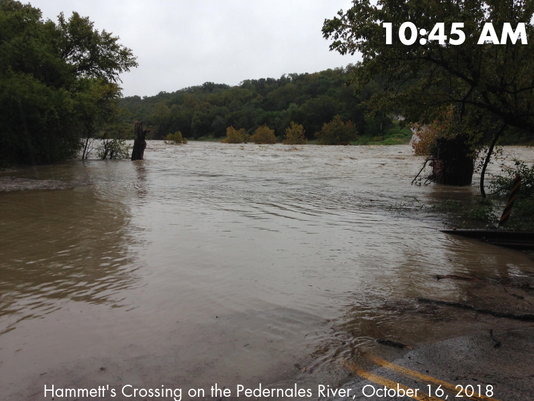 Hammett’s Crossing, the low-water crossing adjacent to Westcave, was under 12-feet of water at the peak of the flood. Hammett’s Crossing is named for Captain Washington Hammett, who first constructed a rudimentary crossing for wagons. In 1925, Travis, Hays, and Blanco counties constructed the current bridge that visitors cross today to access Westcave Preserve. Why did Hammett’s Crossing flood so greatly for so long? This bridge on the Pedernales sits at 692 feet above mean sea level (msl). The Pedernales River meets Lake Travis approximately 7 miles downstream. Lake Travis is considered full at 681 feet msl and is the only lake in the area used for flood control. Therefore, this October when the rain from the surrounding area drained into Lake Travis, the lake level rose to a high of 704 feet msl. 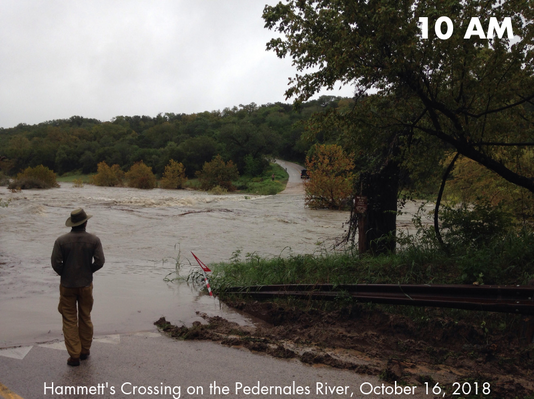 As a result, Lake Travis backed flowed into the Pedernales River, which started flowing upstream and put Hammett’s Crossing under 12 feet of water. For example, the worst drought on record in Central Texas lasted from 1949 to 1957. Lake Travis dropped to 614 feet msl on August 14th, 1951. Then, on September 11th, 1952, the skies opened up and dumped 23 inches of rain in a 24-hour period upstream of Hammett’s Crossing. Eyewitness accounts say the water crested 70 feet above the bridge. This flood stripped the river banks and destroyed many of the old bald cypress trees, still visible today. Lake Travis rose rapidly that month from 619.06 to 677.73 feet above sea level (a 58.67 feet difference). These historic rainfalls and floods continue to astonish and amaze even those of us who are accustomed to life in Flash Flood Alley.